A nation longs for God's promise, and a huge surprise! 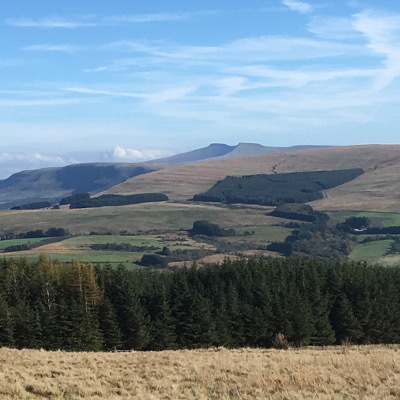 After only four days back home, we drove east into the heart Mid-Wales and spent two days near the Brecon Beacons. This is such a beautiful part of the country and shows not only the work of an Awesome Creator but also generations of dedicated farmers tilling the soil and tending their flocks and herds. Views like this of such amazing countryside continually move our hearts with God's love for the people here. And as we travel about we are conscious of a growing tide of longing and prayer among Christians here for the impending move of God. And reflecting that very thing, a few days ago these words in Ezekiel 3:11-12 really dug into my heart. "For thus says the Lord God, “Behold, I Myself will search for My sheep and seek them out. As a shepherd cares for his herd in the day when he is among his scattered sheep, so I will care for My sheep and will deliver them from all the places to which they were scattered on a cloudy and gloomy day." Our visit here was in response to an invitation back in May from some old friends to come to stay with them and share in a couple of meetings. Thursday night we shared at a monthly meeting at Bronydd Mawr, near Trecastle, just west of the Beacons. 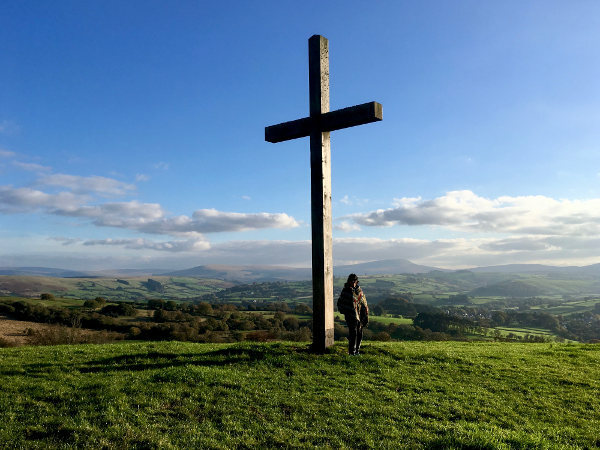 This is one of our many favorite places, and we love the statement made by the massive wooden cross erected on this hilltop. It's as if the Lord has staked His claim on the land, and is declaring that indeed He will "search for My sheep and seek them out." It was wonderful to meet together with old friends and meet new ones, all with a hunger to see revival come to Wales again. The Lord prompted me to share the whole first chapter of Ephesians as the basic framework of our lives in Him. And that from this place of fullness we can pray by faith with assurance for such a heavenly outpouring "that the ground shakes with the sound" like the day of Pentecost, or when Solomon was anointed king "and all the people went up after him, playing pipes and rejoicing greatly, so that the ground shook with the sound." in 1 Kings 1:40. The previous evening we had the privilege of attending the weekly prayer meeting with a dedicated group of members of the Mission Cwmtwrch. The congregation there was started as one of the many fruits of the 1904 Welsh Revival, is still holding fast to its Biblical foundations, and seeking God for His power to break into their area once again. We also had the opportunity to meet with a younger man who very recently moved to Wales with his wife from South Africa. He is English-born and raised, but went to Africa years ago through a sports mission. He spent the last 15 years there, and the Lord began to touch their hearts with a burden for revival in Wales. He contacted me about a year ago and we began praying together via the internet up at the chapel, and together with local friends here once or twice. So what a joy it was to meet them face to face and see them now incorporated into the Lord's preparations! There was also a totally unexpected surprise waiting for us almost immediately after our return. But I didn't make the connection until just a few days ago when I found an unsent reply email in my outbox. Back in late August, a dear prophetic friend had emailed me about an impression he had from the Lord while praying for us. He said, "I believe that you will be asked to preach at one of the monthly Sunday Services very soon now. An unexpected short notice will arise." When we got home Friday night two weeks ago, we were still awash in the richness of our time in the USA. When I went up to our monthly chapel service the following Sunday morning, all I knew was that it was to be a joint meeting with the chapel in Star with who we had shared a baptism in July. Our only participation was to bring something for the refreshments to be served afterward. So as you can imagine, I was totally unprepared when one of the deacons asked me if I could "take the service" that morning only minutes before it was to start! 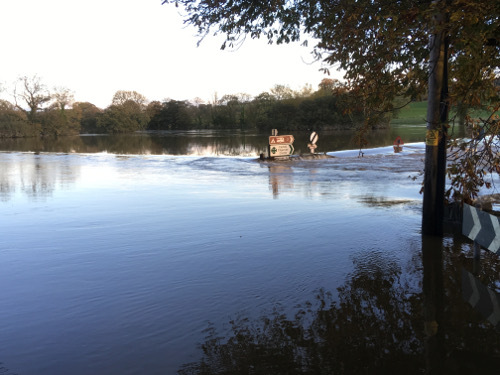 Due to the extraordinarily heavy rains over the previous days, our minister was unable to come because of severe local flooding, as you can see here. The bridge in nearby Llechryd was totally under water. And that's just how I felt when he asked me that question! My ability to speak Welsh is very limited, much less to preach in it. So I asked him to handle the order of the service, announces the hymns, etc., and that I could give a short word, but only in English. He said that would be fine, as everyone also speaks English perfectly well. Towards the end of the first hymn the Lord gave me the section in Ephesians 3:14-21 to preach from, and so when I was asked to come read a portion from the Bible, I was ready, just barely. After the prayer and the next hymn, up I marched into the pulpit and, though timidly at first, spoke from verses 18-19 about our need to hear from one another to learn of God's love more fully! Because mine was the only part in English, it seemed a bit awkward, but we all survived. I was relieved and thankful when, afterward, several of the people thanked me for what I shared. So when I stumbled across Tom's email Monday morning and realized the Lord had indeed given me advanced notice, I was amazed. I hadn't been able to understand how that could possibly happen, and had completely forgotten it. As this point, I'm still not very sure what this all means, other than the fact that Lord is the one who orders our steps, and that He will bring about all his plans and purposes. So we continue to rest in that as we press on day by day. 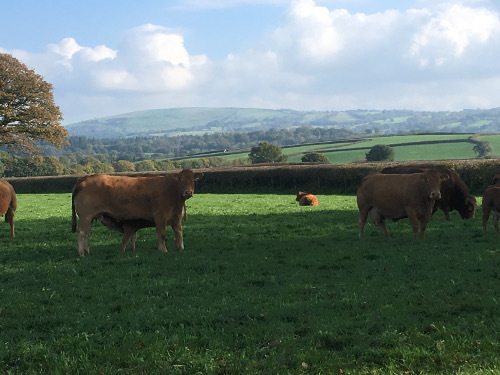 California delights, and at home in Wales again! As we winged our way back homewards last Thursday, we could only smile with love and gratitude as we reflected on the wonderfully blessed time our gracious God gave us. Countless times I have noticed Gladys with her eyes closed and the trace of a smile on her lips. And I too have frequently found myself in a kind of warm afterglow of the Lord’s goodness that has surrounded us during these past four weeks which have amazingly flown by. This whole trip was a real family extravaganza. 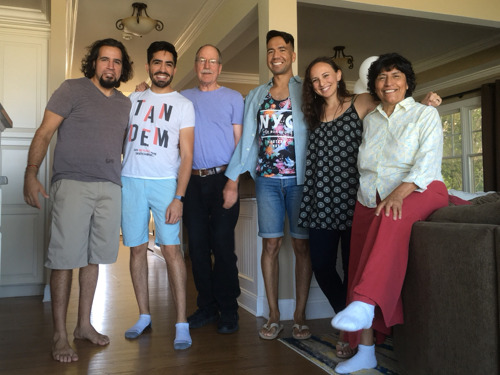 We had nearly three weeks with some of our own family, and also saw it grow through a joining by marriage. 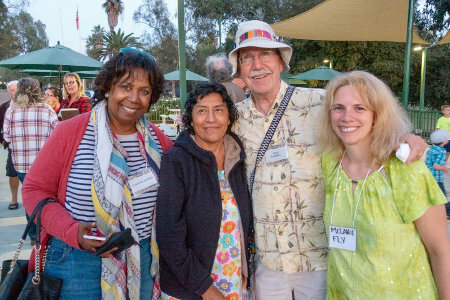 And then the icing on the better-than-delicious cake was our trip to The Gathering in Southern California that I mentioned in our last update. We spent the better part of four days in the company of a few hundred old friends and acquaintances we hadn't seen for ages. There were some richly anointed times of worship and prayer, as well awesome testimonies, prophetic words, teachings, small group discussions, and spontaneous prayer. But for us, the best part was the many opportunities for fellowship and sharing one to one or twos or threes. The dining hall was a constant buzz of old friends catching up after years of not seeing one another. 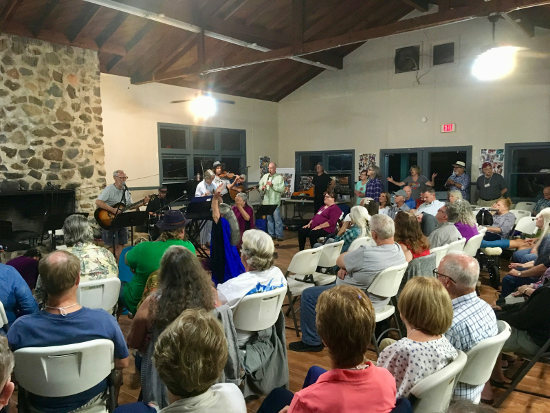 And during every free minute outside the widely spaced activities, no matter where you looked there were people chatting with wonderful joy along the roads and pathways, campsites and the different buildings used during the event. As very special treat for us was meeting up with Bob and Myra Trolese. He and I got saved within weeks of each other at The Lord's land in Mendocino, CA in 1973. Then in March of 1976, we drove together to Guatemala with a small mission group called the Love Lift Team to lend a practical hand in Guatemala City after the devastating earthquake there. And then in 1978 we were both married. 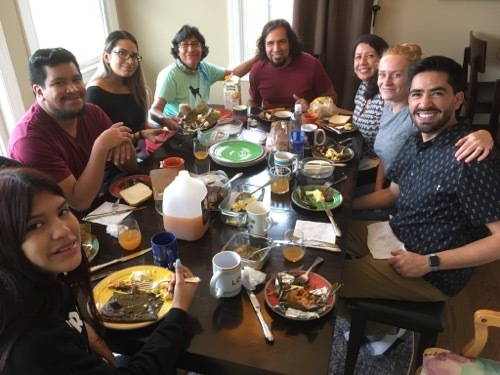 Bob married Myra who came with a small group from Portland, OR, and I married Gladys who came with a few other young folks from Guatemala City to experience a Christian discipleship community lifestyle. 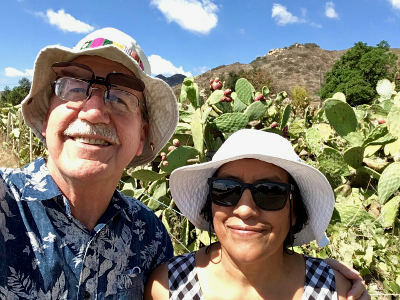 In 1980 Bob and Myra led a small missionary group to Managua, Nicaragua, and in 1982 we led a team to open a church in Quetzaltenango, in Guatemala's volcanic highlands. We have kept in most close contact over all these years, and it was really a joy to find that they would also be at the Gathering. Bob has been struggling with ocular lymphoma over the past year and seems to be making some good progress now. It has been a very difficult time for them. Please do keep them in your prayers as the Lord continues to complete His plans in and through them. Another very special encounter we had was with these two ladies, Ester on the left, and Melanie to the right. We first met Melanie in Dallas in 2012 within days of her first email to us when we were about to drive to Texas from Louisiana! She was from Wales and wanted to thank us for praying for her nation. Then about 6 weeks later, we got an email from Ester to thank and encourage us in our prayer for revival in Wales and also to tell us how God had stirred her heart towards Walesin a powerful way. So, at last, we got to meet face to face for the first time. It was our great pleasure to introduce them to each other. This was one of those amazing set-ups that only the Lord can arrange. Melanie had followed God's calling and just moved Escondido 6 weeks before. And you can imagine the joy as they discovered their common interests in more than just Wales. We are continually amazed to watch how He is moving His people to and fro around the globe with perfect timing and placement for the fulfillment of His purposes. To sum up all that transpired during our time in California, suffice it to say that God's faithfulness to His sons and daughters never ever runs out. We met many younger people whose lives have been touched through many old ministry friends, and also saw many whose fervor for the Lord has held strong or been rekindled along the way. There was great joy in the camp as we all discovered the truth of what Paul said to the saints in 1 Thessalonians 1:2-4. "We give thanks to God always for you all, making mention of you in our prayers, remembering without ceasing your work of faith, labor of love, and patience of hope in our Lord Jesus Christ in the sight of our God and Father, knowing, beloved brethren, your election by God." 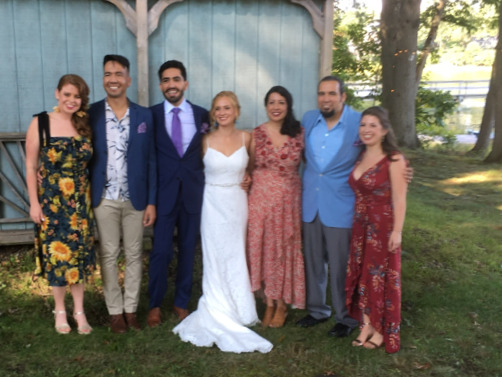 Last weekend was our son Richard and Emily's wedding, and what an incredibly blessed and marvelous time we all had! 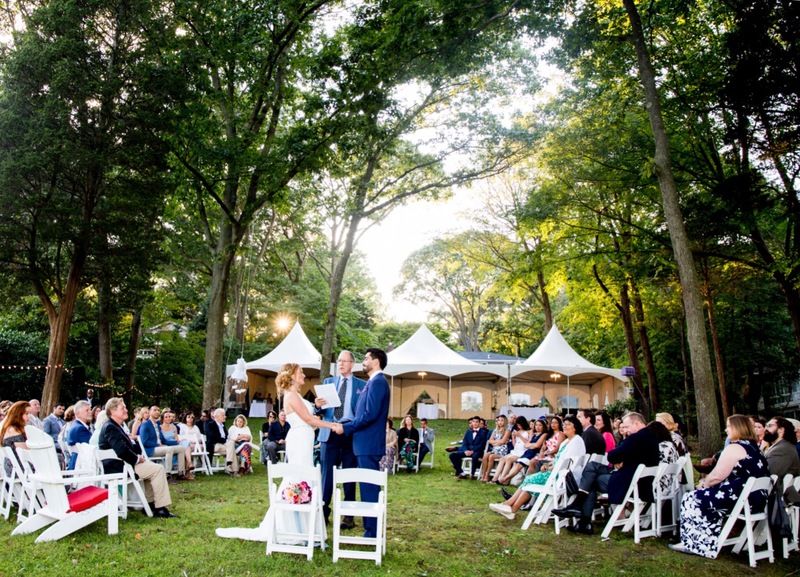 It was a back yard wedding at Emily's family home in Northport, Long Island, NY. One of the many reasons it was such a special time is that we got to be with all four of our kids for the second time in about 14 years. Such a gift from the Lord! The ceremony was modeled after a Quaker wedding. All the guests sat in a big circle, with the bride and groom on the side nearest the water's edge. After a prayer and introduction, Richard and Emily spoke very moving (read tearful!) words to each other. Then, one by one, several of the guests stood up and briefly shared fond memories, words of encouragement, counsel and blessing. From Emily's side of the family were her parents and her two sisters, complete with uncles and aunts and cousins as well. Plus all of their friends, most of whom we'd never met and others we had not seen for about fifteen years—all now mature young adults busy in their professional lives and doing things we only dreamed about when we were younger! As most weddings are, it was a great gathering of family and friends from all over the US and some other nations too. Gladys' niece with two sets of younger cousins came up from Washington. They have been a family hub for our east coast kids since we've been in Wales. And my sister came from Connecticut with her husband and a daughter with her family, as well as my niece and nephew from my other sister came from Boston and New York with their families. More than being an obviously wonderful and joyous family affair, that time of several people taking part and speaking their hearts was just exceptional. There was a very palpable sense of love pervading the atmosphere, and many people commented about it afterwards. To me it made a great picture of what a healthy church should be doing on a regular basis, "building itself up in love," as it says in Ephesians 4:16. Ephesians 5:19 also instructs us well, "speaking to one another in psalms and hymns and spiritual songs, singing and making melody in your heart to the Lord, giving thanks always for all things to God the Father in the name of our Lord Jesus Christ." Once again we have been so aware of God's grace over all, as we joyfully discovered so many amazing people in our new extended family! And in the days before, during and after the wedding we've continued to see Him orchestrating things. A quick example is that I wasn't able to print all the two scripture portions I needed, and so, of course, of one Emily's aunts stood up and read a print-out of the exact verses I was going to use from 1 Corinthians 13:4-8! It says, "Love suffers long and is kind; love does not envy; love does not parade itself, is not puffed up; does not behave rudely, does not seek its own, is not provoked, thinks no evil; does not rejoice in iniquity, but rejoices in the truth; bears all things, believes all things, hopes all things, endures all things. Love never fails." 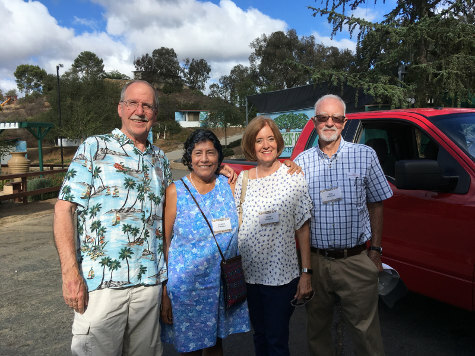 This morning we woke up in Southern California with old friends, and Thursday we drive down to the The Gathering 2018, a reunion of people who were saved during the days of the Jesus Movement in the late 60's and 70's. So more God-adventures are in store. Thank you so much for your prayers, that's why our blessings are abounding! There will surely be opportunities to speak of our prayer mission in Wales, and that means even more saints will be praying for the coming revival.